Unknown group of the 5th Battalion in around 1939. Sergeants' Mess of the 5th Battalion, King's Own, Christmas 1940 when they were based near Lowestoft. Back row: Sergeants J Reed, H Beavers, A Parker, Lance Sergeant J Barwick, Sergeants W Farrell, J Ford and E Gardner. Third row: Sergeants A Mawson, J Roberts, J Lavelle, H Gibson, W Rawcliffe DCM, T Stephens, Lance Sergeant W Jenkins, Sergeant H Dormand (RAOC), Lance Sergeants F Greer and J Hart. Second row: Sergeants J Gillibrand, B Underwood (RAOC), W Wade, C O'Malley, J Woods, A Alberts, W Whittle, A Tague, A Gainer, A Greene, G Younger, A Gates, C H Revill (APTS). 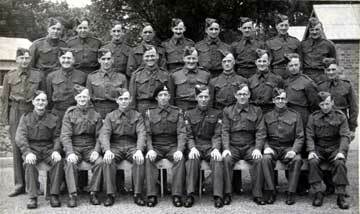 First row: Sergeant Alfred Myers, Lance Sergeant A Wilkinson, Sergeant L Watson, CQMS R Leadbetter, J Cavanagh, J Watson, Platoon Sergeant Majors J Howson, James Bell, CQMS W Gosling, J Tymon, J McKernan, Sergeant L Miller, Drill Sergeant Knight (Coldstream Guards). Sitting: Company Sergeant Majors P King, J Northam, J Wright, Orderly Room Sergeant J McFetridge, Captain and Adjutant F B Richardson MC, Lieutenant Colonel R M J Goldie OBE, Regimental Sergeant Major G Heaysman, Major J A Head, RQMS F Kenyon, Lieutenant and Quartermaster W Lucas, Company Sergeant Majors R Berry, W Roberts and Hornby. 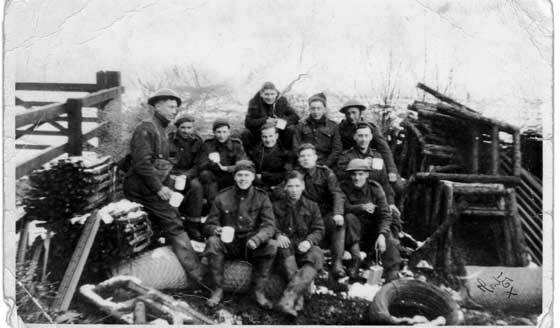 Group of soldiers of the 5th Battalion taking a break from building defences in the Lowestoft area, sometime between November 1940 and March 1941. Sergeant Alfred Myers appears in the group, directly below the soldier who is seated high at the back with the mug in his hand. Officers of the 5th Battalion, King's Own Royal Regiment, at Ipswich, in 1941. Shortly to be converted to 107th Regiment Royal Armoured Corps (The King's Own).